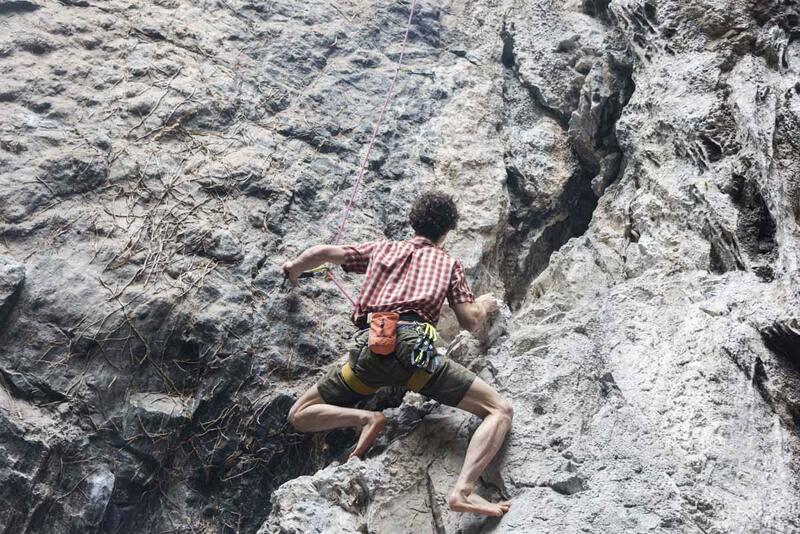 Have you ever considered climbing in Arco, Lake Garda? 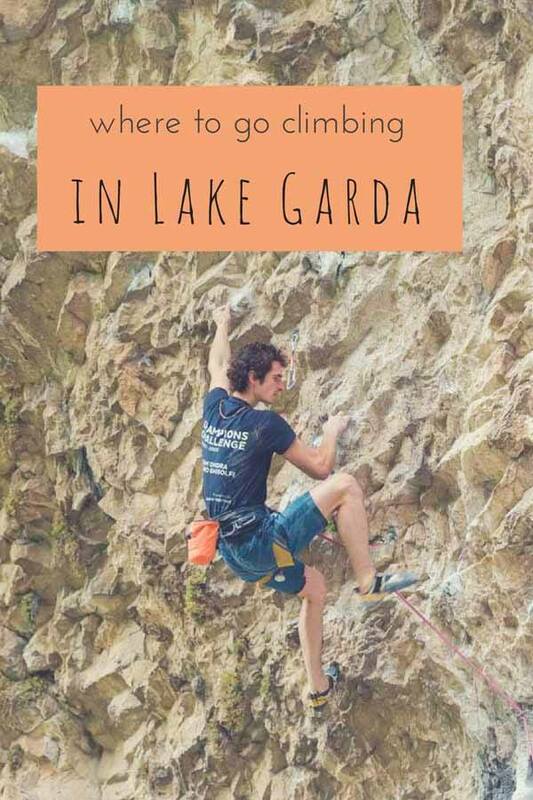 After our multiple hiking trips to Garda Trentino, we decided to have a go at rock climbing in Arco, one of Italy’s climbing hotspots – and we were honoured to spend the weekend with Adam Ondra, the world’s best rock climber. This post has long been in the making. 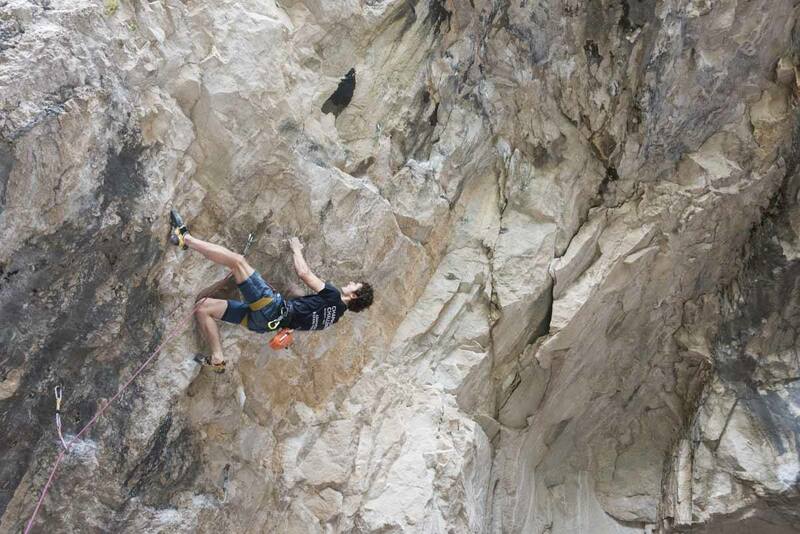 In the ‘Draft’ folders of this blog, there’s one titled ‘On Rock Climbing, and Why it is Awesome’. 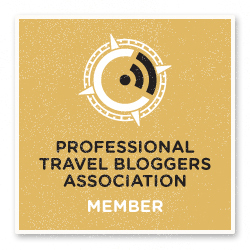 It’s dated February 2014, when this blog was only a few months old. At the time, Nick and I were keen rock climbers (keen, not good, being the operative word). We had been climbing for a few years, first with friends, and then with a local mountain club – we had even completed a mountaineering and rock climbing course. I loved climbing the first time I put a harness on, but my relationship with the discipline was always a difficult one. To put it simply, I am not completely comfortable with heights. Having started climbing around the age of 30, I have never had the devil-may-care recklessness of those who started when they were children. I have had my share of difficult moments, bordering on full-blown panic attacks. Yet, even those moments made my love for climbing even stronger. The sense of achievement, the elation I felt when reaching the top of challenging pitches is unlike anything else on earth – climbers will know what I mean. And then, just when I was starting to get quite good, we quit. We never fell out of love with climbing. This blog came along, and it took up all our energy (especially during the first two years, when I still had a full time job). We started going to events, press trips and whatnot. Our fitness suffered, we both put on weight, and climbing became a challenge. Our climbing equipment lay forgotten in what we call our ‘mountain cupboard’ – our ropes, quick draws and climbing shoes gathering dust in the darkness. Then, we received an invitation. You know of our passion for Garda Trentino, the northernmost stretch of Lake Garda, Italy’s largest (and most beautiful) lake. 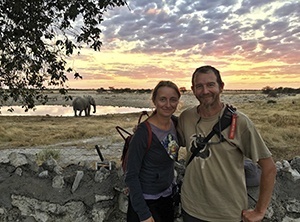 We visited the area several times – for an adventure weekend on Lake Garda a few years ago, and twice this year to hike Garda Trek. In summer we did a two day trek to Rifugio Pernici, and for late September we had planned another hike, to the top of Monte Altissimo. Valentina, our friend from the Garda Trentino tourism board, invited us to stay an extra couple of days after our September hike. 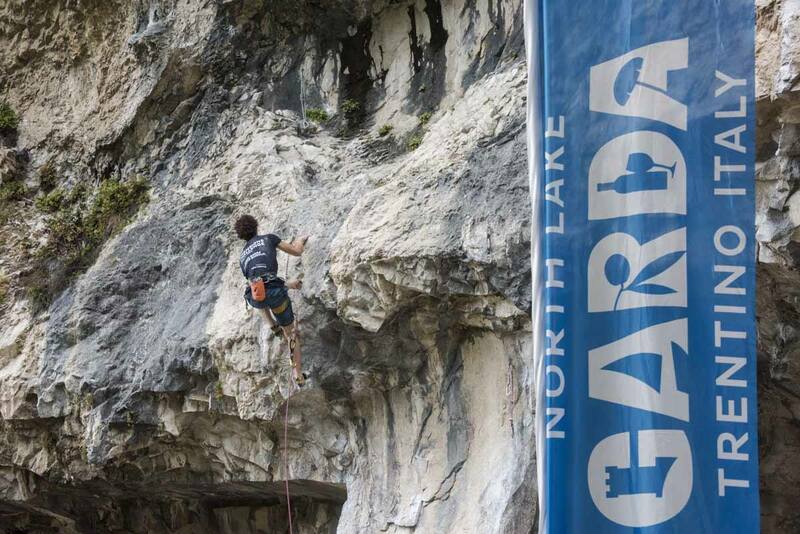 The plan was going climbing in Arco, one of the Garda Trentino towns. ‘We’re hosting a climbing event’, she said. 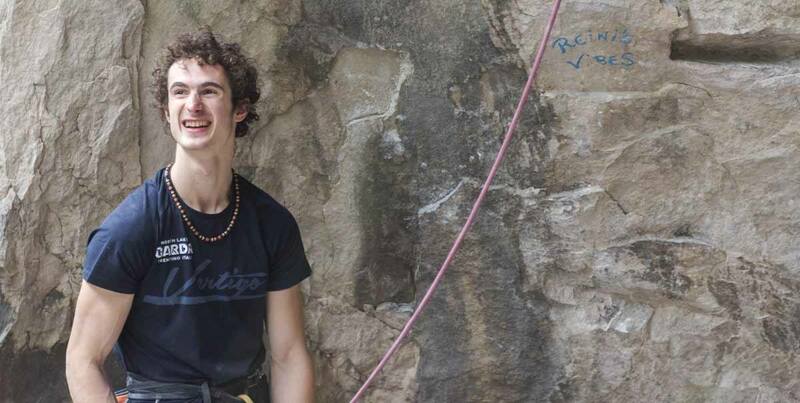 ‘Adam Ondra will also come’. 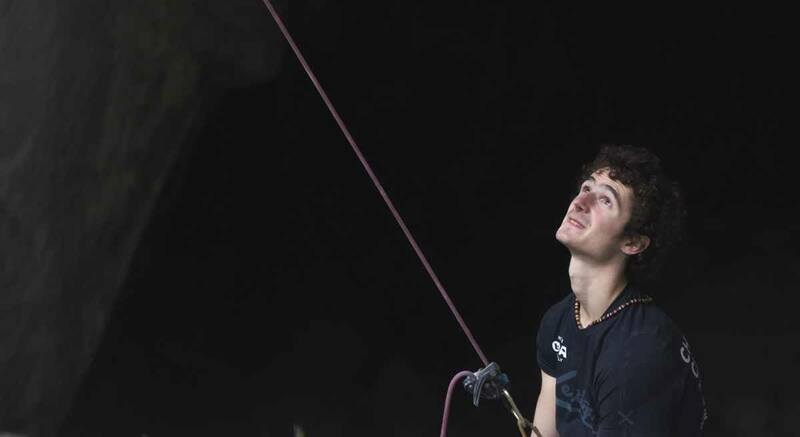 Now, if you’re not a climber, the name ‘Adam Ondra’ will probably mean nothing to you. 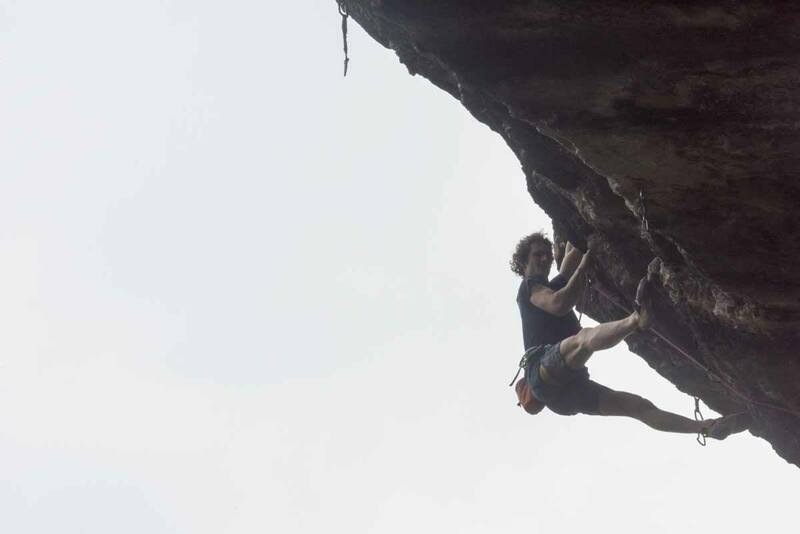 But if you are, you’ll be aware that in the climbing world Adam is pretty much God. I had seen him countless times – on the covers of climbing magazines, on posters in climbing shops and gyms, his wiry profile climbing some incredibly hard pitch, or advertising the newest climbing gear with a coy smile. Climbing or not, Arco is amazing! Adam is only 24, but in his life he has already achieved more than many lifelong climbers – he was the second climber ever to complete Dawn Wall, the toughest ascent of El Capitan, and this summer he managed to close the first 9c pitch ever, a gravity-defying feat that took years of planning and preparation. The idea of meeting a living legend was something that we simply could not resist. Arco is Italy’s climbing mecca, a place that most climbers from Italy and beyond know like the back of their hand. Even our tiny mountain club organised frequent climbing outings to Arco – but somehow, we never actually managed to visit the area. Arco’s falesie (climbing crags) are among the best known in the Alps – many climbers, including Adam himself, took their first ‘steps’ on the rock there. Nowadays, walking around Arco, the town’s love affair with climbing becomes immediately evident – climbing shops outnumber cafes and restaurants (there are 17 on the main street alone! ), and people walking down the street with a rope slung across their shoulders or a bag of chalk tied to their belt didn’t attract a second look. Massone is perhaps Arco’s best known climbing crag, with over 150 pitches, ranging from easy ones for children and beginners (i.e. us) to gravity-defying challenges for daredevils. Massone climbing is on limestone, and thanks to Arco’s climbing schools and guides, the pitches are always very well maintained. I know, there are LOTS of Adam pics – fangirl moment! Arco is also famous for hosting Rockmaster, the world’s most popular climbing event and competition, held every year since 1987. The first year, Rockmaster took place on mount Colodri, but from the following year onwards it was held in a purpose-built climbing stadium. 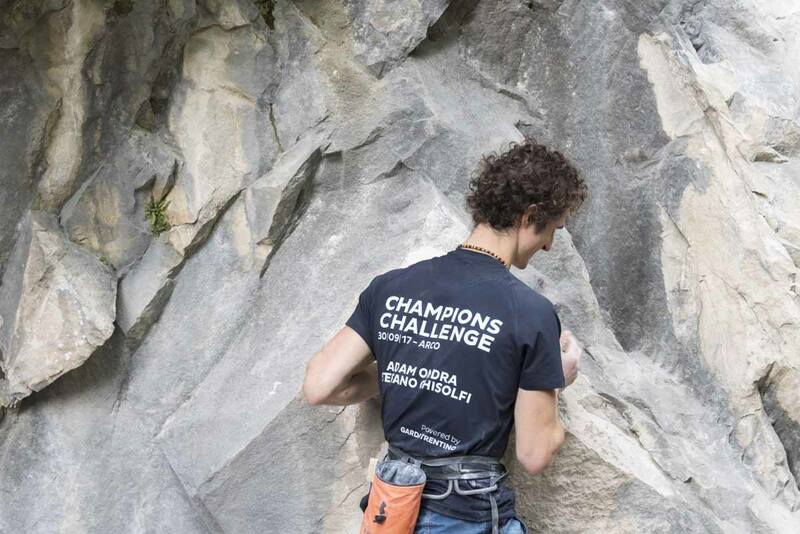 The climbing event we were going to attend in Arco was called Champions Challenge, and besides Adam Ondra it also involved Stefano Ghisolfi, an Arco resident and European climbing champion. 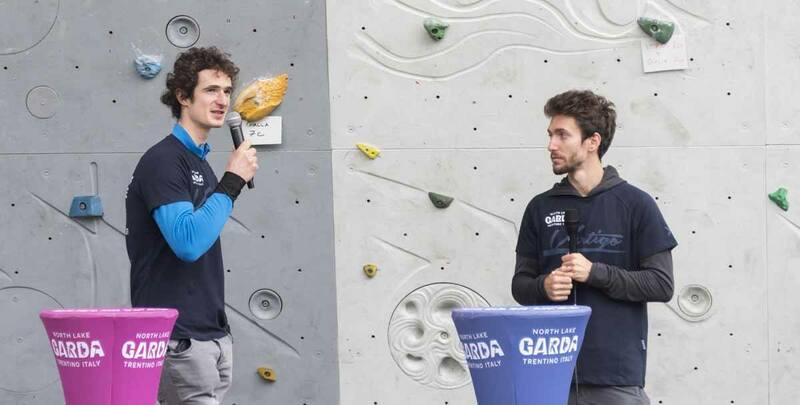 The event started in the morning at the Rockmaster climbing stadium, where Adam and Stefano shared climbing tips and stories. They spoke about physical preparation, about correct diet, about their training routine. 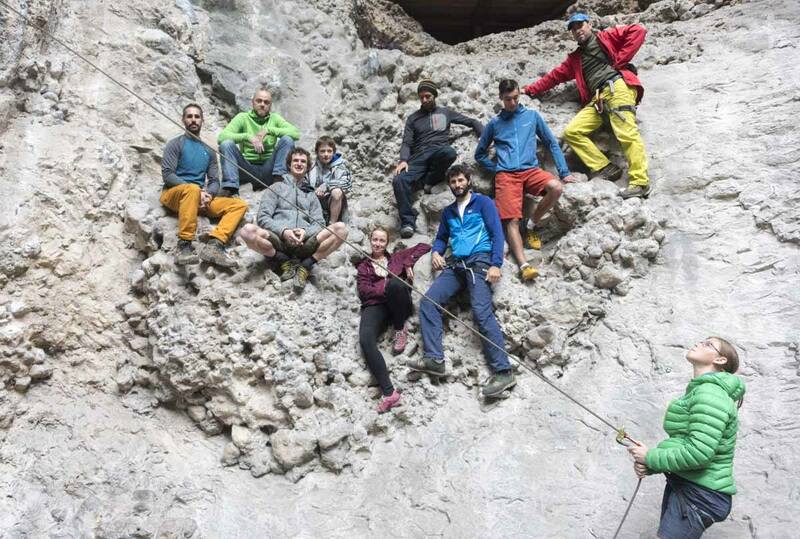 They chatted with fans, talked about their most popular climbing feats, posed for selfies. Climbing – A Metaphor of Life? This made me think of how, in my eyes, climbing really is a metaphor of life. It is not just when we climb that we are afraid of falling and failing. Falling is a decision resulting in a negative outcome. It could be something as mundane as taking the wrong step, falling over and spraining your ankle – my injury during the Turgen-Ak Suu hike in Kyrgyzstan, from which I haven’t yet fully recovered. Or it could be investing in the wrong business idea, putting faith into someone who would then disappoint you. 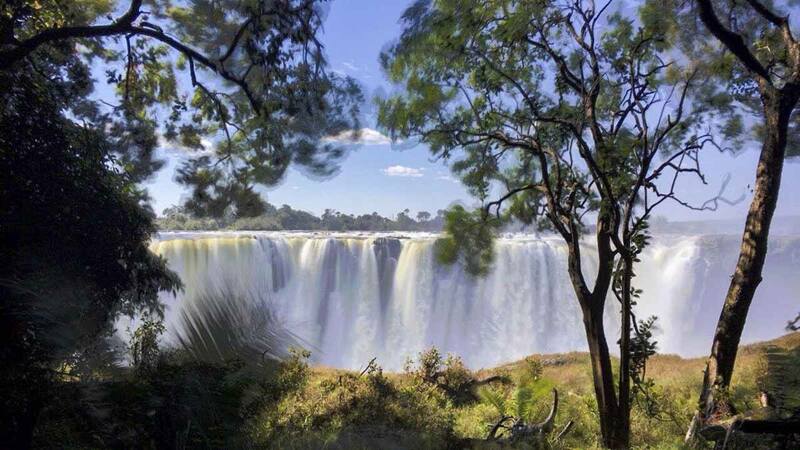 We have all fallen, and risen from our falls wiser, changed – but failing, that is a different story altogether. Failing means trying and not succeeding, despite putting all you have into your feat. It’s when you spend months studying but fail that exam. It’s when you work day and night to get a promotion, but your colleague gets it instead. Falling involves a certain element of fate, whereas failing is related to a variety of things – but ultimately, it leaves with the idea that we should have tried harder, that it is somewhat our responsibility. However, that doesn’t mean we can’t try again – and just as we learn from falling, we also learn from failing. Even heroes sometimes ‘fail’ – later that day, Adam told us of his attempt climbing Dawn Wall, and how Day 4 on the wall was a total failure. He did everything he could, all the elements were in place – but he just couldn’t climb. The lesson? Perseveration is key. It’s necessary to learn to challenge one’s limits, but we also need to accept when enough is enough. On Day 5, Adam tried again – he was able to get past the ‘crux’, and progressed up the wall, reaching the summit three days later. The second part of the Champions Challenge took place at Massone, Arco’s most famous climbing crag, where Adam and Stefano would ‘challenge’ each other and attempt to climb a 9a pitch that had never been climbed before. The event attracted a small crowd, all in awe of being able to witness two climbing legends tackling the rock. Adam and Stefano reached the crag, then sat around for a while observing the pitch, studying the movement they would have to do to complete it successfully, without falling. Then, they both took a ‘trial run’, climbing the pitch a little at a time, cleaning the tiny holes and hand holds with a toothbrush they both carried in their harnesses. 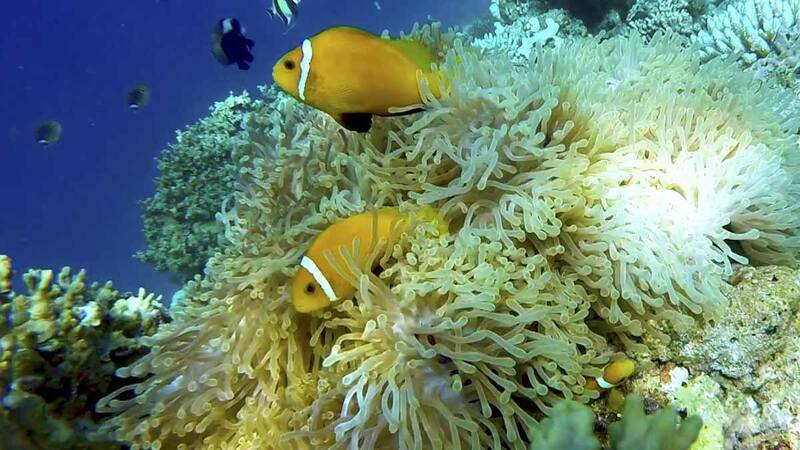 Adam was slow and graceful, almost dancing on the rock – the natural element for a guy that was introduced to vertical life when he was only a few years old. Stefano’s climbing was faster, more energetic – it was amazing to see how two champions tackled the same climbing challenge in two completely different ways. Yet, as I said before, even heroes fail. After the trial run, when it was time to climb the pitch, Stefano and Adam both fell during the most challenging section. Then they tried again – and fell again. Now, one would think that after the second ‘failure’, the mood of the crowd and of the athletes would have got more sombre. In fact, the opposite happened. The support of the crowd grew, with every single person shouting aleeeeeeee as the two tried the pitch one last time – and fell again. Never mind, Stefano added. I live just next door, I’ll climb this pitch next time. The following day, it was our turn. This time we wouldn’t just watch Adam climb – we would climb with him. It was a rainy day, so we headed to a nearby cave with a few pitches sheltered from the elements. To be honest, when I saw the bad weather, I really wanted the climbing expedition to be called off. We would climb again after three years, with the world’s best climber – saying that I was feeling nervous would be an understatement. Once we got in front of the wall, my hands were shaking. The series of movements that once came natural to me were very difficult – I couldn’t remember how to tie the proper knots, how to secure myself. The rock felt alien beneath my fingers. I kept touching it, rubbing it furiously, looking for hand holds. I couldn’t remember how to balance myself, how to use my legs instead of my arms to reach upwards, how to climb in that graceful manner that Adam showed so well the previous day. I reached the top, but I looked and felt like a potato sack. I decided to try again. And again. It was a bit better – my heart didn’t pound in my chest quite as furiously, and the movements came back to my mind. By the fourth attempt, I was happy. Climbing is not like riding a bicycle – if you don’t practice constantly, it will be hard to keep up. 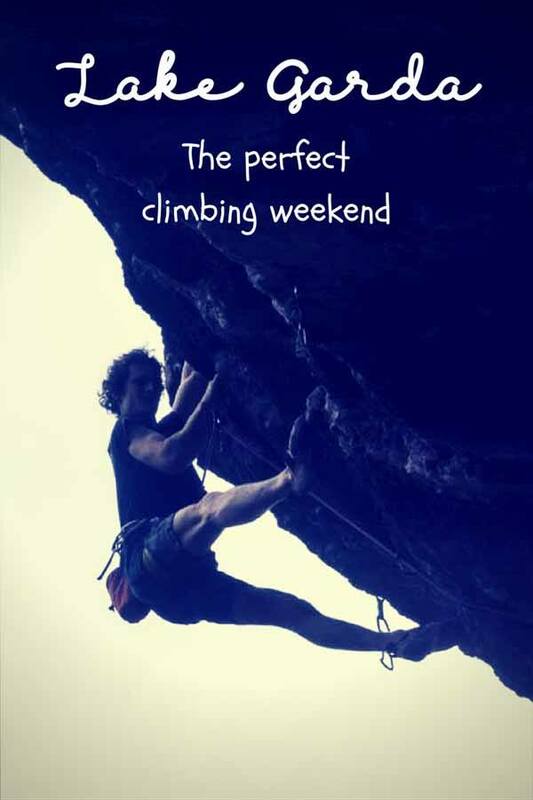 I am far from the level of ‘climbing proficiency’ I managed to master three years ago, but climbing in Arco with Adam Ondra reminded me of one thing – how much I love rock climbing. 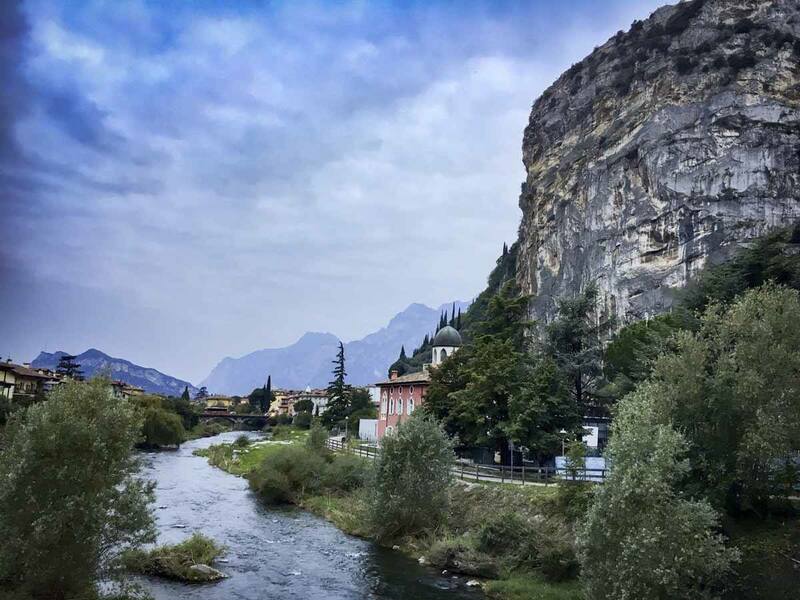 You can reach Arco by car (exit the A22 at Rovereto Sud, then follow the signs for Riva del Garda – Arco is just next door) or by train to Rovereto, then bus. 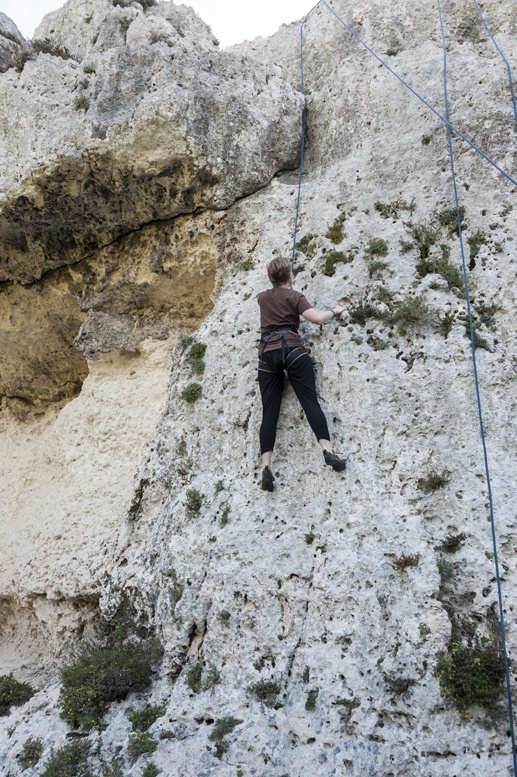 If you’re an expert rock climber, having your own car is probably a good idea, as most of the climbing crags are between 5 and 20 km from Arco. If you have never climbed before, or if you haven’t climbed for a long time, we highly recommend going with a guide, who can also take care of transport of needed. Mountime is a good place to hire a guide – their mountaineering school is right next to the Rockmaster stadium. It is also possible to climb on artificial walls at the Rockmaster stadium, open every day in spring and summer (weekends only in October). Entrance costs €10, and it is also possible to climb when it’s rainy or after dark. You can also rent equipment from Mountime, to be used at the climbing stadium or at the crags. 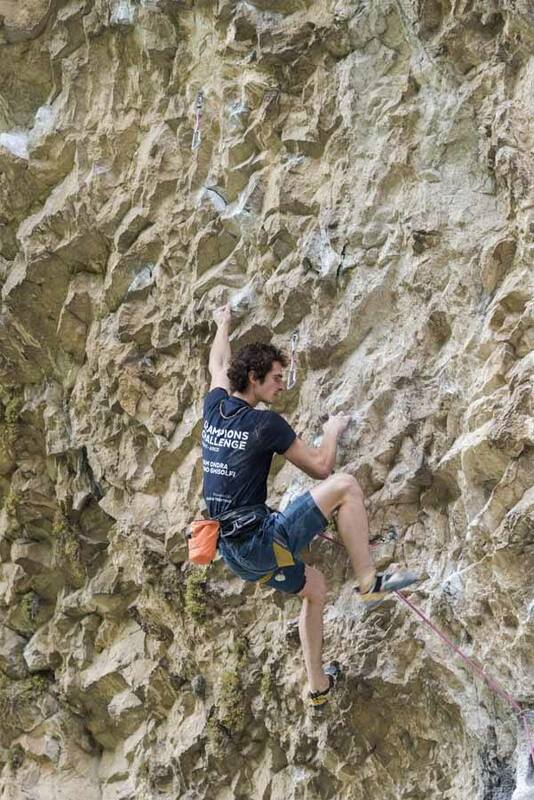 We would like to thank Vale Bellotti from GardaTrentino for making this experience possible, and to Adam Ondra and Stefano Ghisolfi for being legends. 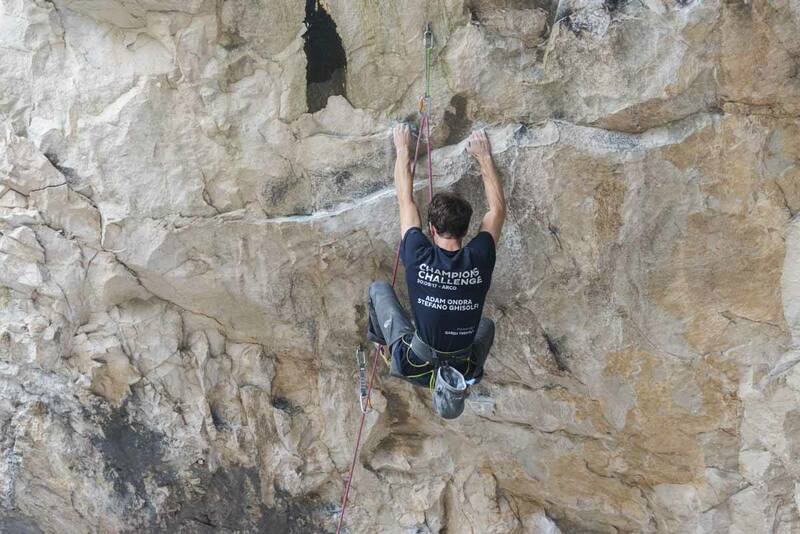 Here’s to a lot more climbing in Arco and all around Lake Garda!